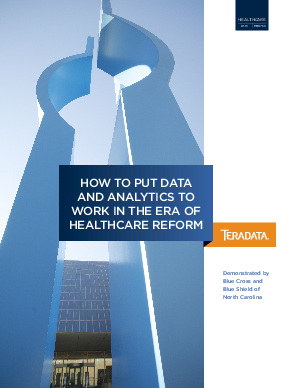 With a Teradata enterprise data warehouse (EDW) at its core, Blue Cross and Blue Shield of North Carolina (BCBSNC) has created a data and analytics-driven environment to improve the health of its members and provide a competitive edge in the era of healthcare reform. First, the company recognized the vital strategic role of data and analytics by creating a Center of Excellence for Information and Analytics Services and moving the group under the Chief Strategy and Innovation Officer, from the CIO. Then BCBSNC initiated a Medical Quality Management Assessment program that relied on the data and analytics environment to enable medical expense reductions of $95 million on a $5 million investment. The company also has begun expanding the way it uses its Teradata EDW, extending it into areas that include strategic planning, network management, product design, as well as fraud prevention and remediation.